Immigrants like Grimaldy Dominguez and Roger Chinchilla launched a mobile banking system. NEW YORK (CNNMoney) –– Roger Chinchilla and Grimaldy Dominguez grew up watching Latin American families struggle in Queens, New York. 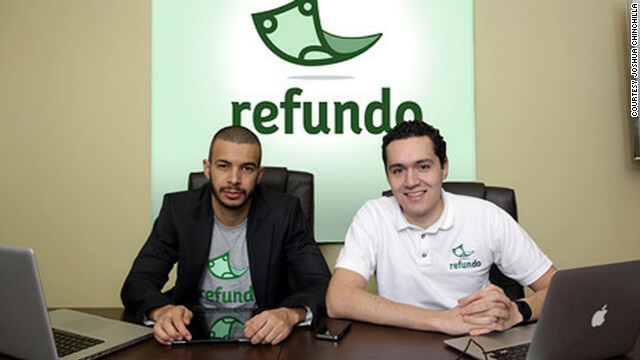 As entrepreneurs, the two have created a free mobile banking system to help Hispanics keep track of their money. Chinchilla came as a toddler from Honduras in 1986, and Dominguez arrived from the Dominican Republic as a child in 1993. As they tell it, both grew tired of watching workers pay sharp fees to cash paychecks at check cashers. In 2009, two years after they launched the accounting software company Rushtax, they realized an opportunity to help their underserved area. Many of the customers who turned to them for tax preparation didn't have a bank account to deposit their tax return. The guys decided to stem the money flow to check cashers by establishing bank accounts their clients could access from their cell phones.